There are probably a lot of companies out there today with only EE (Enterprise) licenses that should look at buying cheaper “Platform” ($50 / mo) or “One-App” ($25 /mo) licenses. Just a few years ago these flavors of licenses were not available and companies were forced to buy user licenses that contained access to the entire “CRM” suite. If you have folks on a full blown Enterprise license (or seat) that do not need Cases, Solutions, Leads, Campaigns, Opportunities, Products and Forecasts (said more simply – they need Accounts / Contacts and access to your Custom Objects), but require all the other functionality that comes with an Enterprise License, then you can be saving a tremendous amount of money on an annual basis switching down to a “Platform” or “One App” license. The big difference between the Enterprise Edition “One App” licenses is that the user has Read Only access to Accounts and Contacts and are limited to 10 Custom Objects whereas the Enterprise Edition Multiple Apps (aka “Platform” license) you have Read / Write access to Accounts and Contacts and access to up to 200 Custom Objects. These types of licenses are great for departments that fall outside of Sales, Marketing or Support. It’s a smart move for Salesforce in my opinion because it removes a big price barrier from rolling on additional departments (selling more seats = greater penetration into an account). To the business owner it allows more “end to end” efficiency with the additional User coverage. 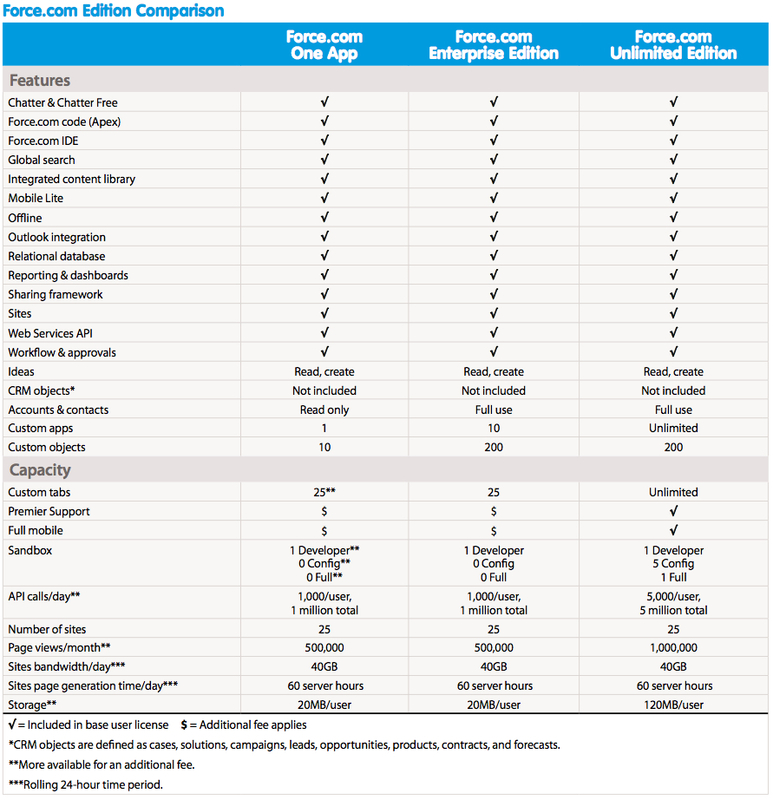 Force.com Platform – (~$50 / mo). Standard CRM functionality is stripped out – so no Campaigns, Leads, Opportunities, or Cases. But you do get access to the “Core” functionality of Accounts and Contacts, Reports, Dashboards, Documents, and Activities. You also get access to the Custom Objects / Tabs that you would have available the with your Enterprise or Unlimited licenses. Force.com One App – (~$25 / mo) This license gives the User read access to Account and Contacts and 1 Application (The Application can have up to 10 Custom Objects or Tabs). Force.com Light (~$10 / mo). It provides access to 10 custom objects and one app. No access to the CRM objects and read only access to Accounts and Contacts. "Light" looks comparable to the older "One App" license with a couple of subtle differences. 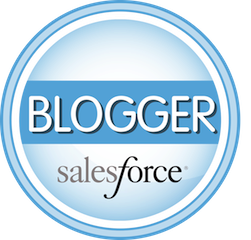 Salesforce removed the Bulk API, Streaming API, and the Sharing model. "Light" supports object-level and field-level security. In contrast, the "Enterprise" license below also supports record-level security. What that means is that with "Light" you can control through the Profile and Permission Sets which custom objects a user can access, if they can read, create, edit, or delete records for that object, and which fields on that object can a user see or edit. Enterprise (below) takes security one step further with Record Access to help you control which records on that object a user can access by leveraging OWDs, the Role Hierarchy and sharing rules. 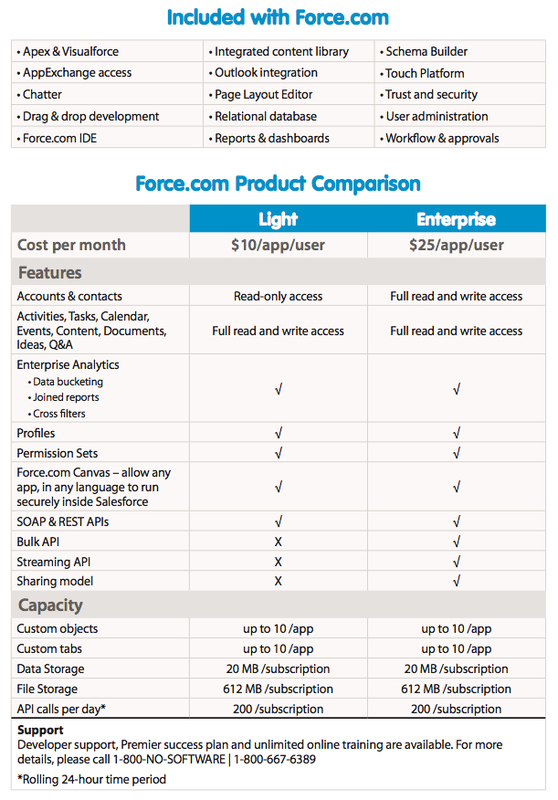 Force.com Enterprise (~$25 / mo). It’s similar to the older Platform license in that it gives you full read and write access to Accounts and Contacts, but they’ve capped the number of custom objects to 10 (down from 200), and access to one app. If that link does not work, once logged in, search “Viewing License Types” in Help.